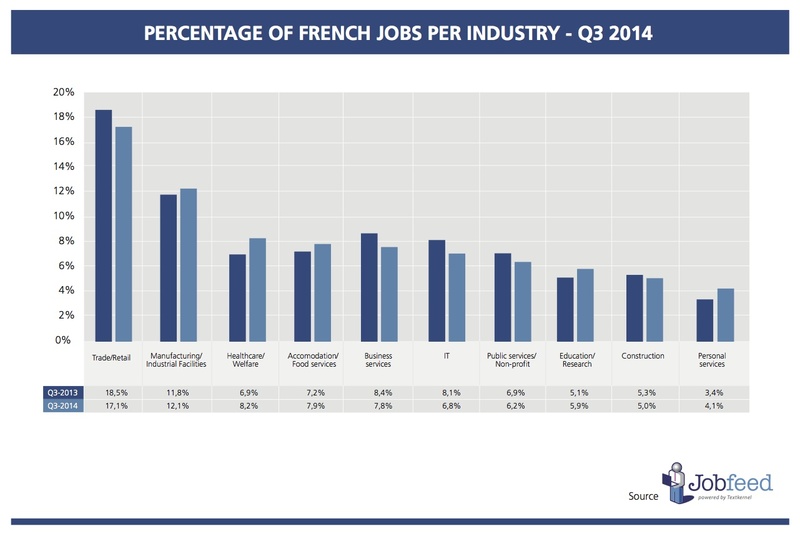 Today Jobfeed published the Q3 – 2014 index on the French online job market. 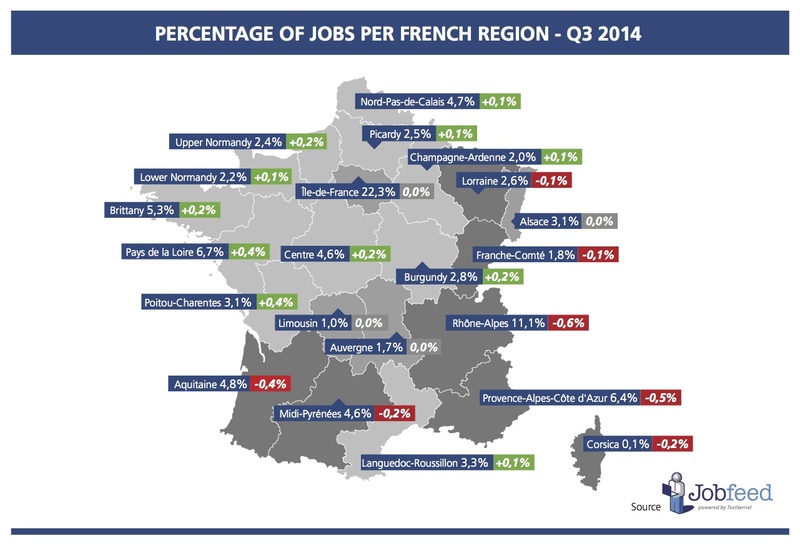 This index is based on the analysis of more than 2.6 million jobs postings (more than 1.3 million unique jobs after deduplication) published in the third quarter of 2014 in France and collected by Jobfeed. Jobfeed is the labour market analytics tool of Textkernel that collects and categorises all online jobs in France into a searchable database. 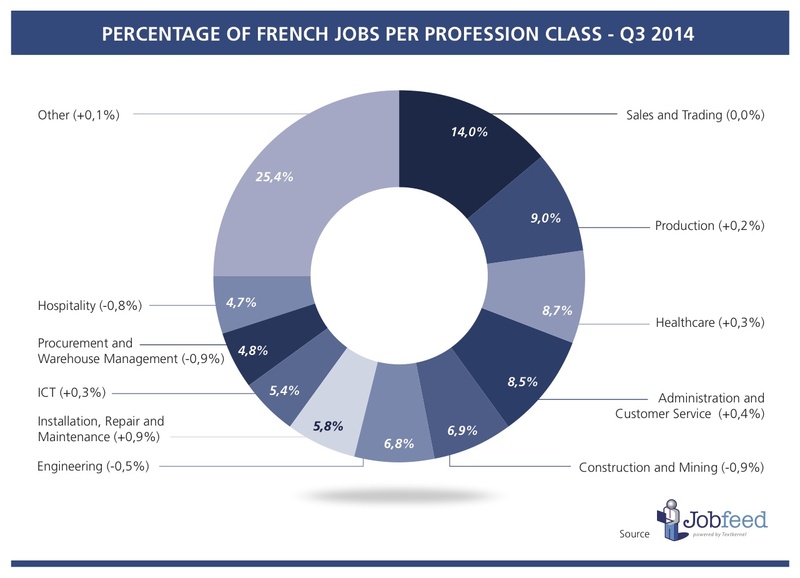 Despite a 1.4% decline of its share of the online job market compared to Q3 2013, the Trade/Retail sector remains the largest employer in France. The Manufacturing /Industrial sector cements its second place, up 0.4 % over the past 12 months. The Healthcare sector jumps from the 6th to the third place increasing its share by 1.4% compared to the same quarter last year. The IT sector continues its descent down 0.5% compared to Q2 2014 and -1.3% over the past 12 months. The Ile-de-France region remains this quarter the major employment area in France accounting for 22.3% of all jobs published online. The Rhône-Alpes conserves its second place, albeit a modest decrease of 0.6% of its share (11.1%) compared to Q3 2013. Pays de Loire consolidates its third place (6.7%) taken from the PACA region (6.4%) in last quarter. With fluctuations comprised between +0.7% and -0.9% the distribution of online jobs among profession classes has barely changed over the past 12 month. The top five professions have been unchanged with Trade/Retail topping the list accounting for 14% of all jobs published online in Q3 2014. This index is also available for the German and Dutch market. Numbers come from Jobfeed, the labour market analysis tool of Textkernel, that collects and categorises all online jobs and makes them searchable. Each quarter, Jobfeed will provide the latest statistics on the online job market. For this analysis 2.6 million French job ads, posted between 1 July and 30 September 2014 have been analysed, categorised and deduplicated. Over 1.3 million unique jobs, excluding internships, remained and are the source on which these analyses have been performed.